The Phil Karlson Thanksgiving Weekend wasn’t planned. It was an act of necessity. The problem is I’d become obsessed with that clip of John Payne and others performing “The Girlfriend of the Whirling Dervish” in Garden of the Moon. (Have you watched it yet? Go ahead. I’ll wait.) After repeated viewings of an impossibly young John Payne deftly tossing off Johnny Mercer’s lyrics, I needed to restore to my memory the older version. His face collapsed yet even more magnetic. In trouble and sinking deeper. The noir John Payne. That actor’s best collaborator was ex-prop man turned director Karlson. Time to revisit their finest hour. 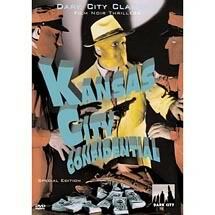 In Kansas City Confidential (1952), Payne plays an ex-con whose efforts to go straight mean nothing when he becomes the unintentional fall guy in a daring robbery. The simmering fury when he’s sprung from jail knowing that no one legit will ever trust him again is scorching. That bone-deep sense of betrayal, of hard work going for naught, charges the rest of the film, which despite the title is set mostly south of the border. Karlson as always keeps the action taut, and there’s the added bonus of what has to be the most badass crew in the annals of noir: Jack Elam, Lee Van Cleef, and Neville Brand. Appetite whetted, I craved more. 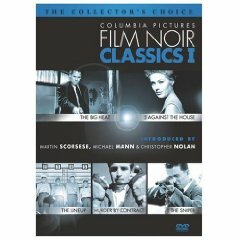 And had it on hand, thanks to the new Columbia Pictures Film Noir Classics Collection. I’d wanted to see 5 Against the House (1955) for years, and not just for Karlson. It’s based on a Jack Finney story, adapted by Stirling Silliphant (In the Heat of the Night) and William Bowers (Cry Danger, The Mob). Imagine my surprise to discover it’s the rare Karlson film that’s a total misfire. 5ATH begins as a tiresome college comedy then becomes a heavy-handed survey of the problems faced by returning Korean War vets taking advantage of the G.I. Bill before settling into a heist groove. The “perfect plan” posited by these aging students would be ridiculous under any circumstances, but on the heels of the ingenious scheme cooked up in Kansas City Confidential it’s downright embarrassing. There’s nice work by Brian Keith as the most damaged vet and a good climax set in an automated parking garage in Reno, but little else. ASIDE: Also in the Columbia collection is a superior Silliphant-scripted drama, 1958’s The Lineup (reviewed here), that features one of the greatest recent commentary tracks. My friend Eddie Muller and novelist James Ellroy tag-team on this one, Eddie providing a native San Franciscan’s view while Ellroy gives full vent to his obsessions. Eddie gave me a heads up after they recorded the track, saying, “It’s a wild one.” It lives up to that billing. In the immortal words of Homer Simpson, you can’t go this far and not go further. On to the Karlson films parked on the DVR. Proudly ignorant, personally repellent, absolutely convinced that their willingness to hire someone to beat money out of someone who worked for a living constitutes some kind of genius and an adherence to a proud tradition. 99 River Street, a John Payne/Phil Karlson film that screened at Noir City 2007, is currently available on Hulu and Fancast. You could be watching it right now! Here’s Ivan’s take at Thrilling Days of Yesteryear. I look at Karlson’s final film Framed here.